Everyone has had the experience of sitting through a bad presentation. Those are the presentations where the lights go down, the audience is faced with slides filled with text, the speaker begins by reading each slide, and the room fills with the sounds of snoring. No one sets out to give a bad presentation, but you can set out to give a good one. If you follow these 27 presentation tips, the sounds that you hear at your next presentation are sure to be clapping, not snoring! Here are 27 presentation tips that will help take your presentation from bad to good. 1. Create an appealing cover slide. The opening cover slide is often overlooked, but it plays an important role in setting the tone and style for your whole presentation. Use a captivating graphic on your cover slide to catch your audience’s attention. If you keep your presentation short, it will be easier for the audience to remember the important information. Bombarding people with information just confuses them. Besides, no one has ever complained a presentation was too short! Steve Jobs was a master communicator and presenter. One of the things that made him so effective was that he followed the rule of three in his presentations. To follow the rule of three, make sure that your presentation touches on three major ideas. You can then use stories, graphics, examples, and analogies to elaborate on these three ideas. 4. Use a maximum of ten slides. Guy Kawasaki’s 10/20/30 Rule is that a maximum of 10 slides should be given in 20 minutes, and the size of the text on each slide should be no less than 30 point. Following Kawasaki’s rule forces you to make sure that the information provided on each slide is necessary; it also forces you to explain your slides. 5. Use slides to clarify points. Slides are there to reinforce your message. Do not let them carry the entire message. You should also avoid reading the slides directly or using them as a crutch. 6. Design your own template. Consider designing your own template by following some of the steps given on various websites, or purchase a template. This will allow you to create the theme that is best suited to your presentation. Audiences have seen the common PowerPoint templates time and time again, so give them something different to look at. The extra effort that you take in creating something unique will pay off in helping to maintain audience attention. 7. Make sure that your content is correct. Edit and proofread your slides to make sure that the spelling and grammar is perfect. No one wants to look at a slide that has a spelling mistake on it, and no one will trust the opinion of someone whose presentation is riddled with errors. 8. Make sure that your presentation flows from one slide to the next. Smooth transitions can help your presentation to flow easily from one idea to the next and from one slide to the next. You do not necessarily have to use fancy style transitions, but you can use verbal clues to tell your audience what is coming up on the next slide—and why they need to know! There is an old public speaking tip that says to tell the audience what you are going to tell them, tell them, and then tell them what you told them. Presentations should follow this same format. Prepare your audience for what is coming, and then use the body of your presentation to tell them your three major points (refer to tip #3). Use your last slide to summarize your presentation and remind the audience about key points they might have already forgotten. 10. Consider using other types of presentations. Instead of PowerPoint, consider alternatives such as Prezi, Easel.ly, or SlideRocket, which are available on the Internet. Using a different type of presentation may not only inspire you to stretch your creativity, but it may also inspire your audience. 11. Don’t put too much information on one slide. Try to keep your slides clutter-free and full of blank space. Don’t include too much text. A good rule of thumb is 30–40 words per slide. According to a 2015 study by Microsoft Canada, the average human attention span is eight seconds, which is less than the attention span of a goldfish (nine seconds)! You need to be clear and get your point across quickly before your audience zones out. Don’t use clichés—even though you should “think outside the box,” for instance, your audience has heard that tired cliché hundreds of times before. Make sure that the text on your slides is meaningful to your presentation. 13. Use appropriate fonts and sizes. Serif fonts, such as Times New Roman and Garamond, are easy to read at smaller sizes, but the serifs are often lost on a large screen. 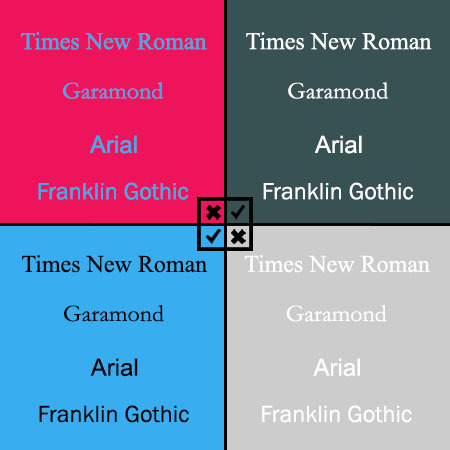 Sans-serif fonts, such as Arial and Franklin Gothic, work well for presentations. Consider using unusual fonts (within reason) to keep the audience’s interest. You can download fonts from DaFont, 1001 Free Fonts, and other font downloading sites. Just be sure that the font does not make your text difficult to read. Remember tip #4: Use nothing smaller than a 30-point font size. Keep in mind that, if you use a smaller font and the audience can see your slide, you will quickly be out of sync with them because they can read faster than you can talk. Different colors evoke different emotions. For example, red is associated with passion and urgency, blue is calming and evokes tranquility, orange conveys energy and warmth, and green is associated with nature and the environment, while black is heavy and formal. Warm colors, such as red and orange, can be used to highlight, while cooler colors can be used in the background. You should also make sure that the colors complement each other. For the audience to be able to see the text, it must contrast with the background color. For example, use a dark green background with white text or a light blue background with black text. Accent colors are used for emphasis and should be used sparingly. No matter what color combination you choose for your presentation, make sure that you use it consistently. Do not use blurry pictures, overly familiar clip art, or eye-roll-inducing stock photos. Try to use images the audience may not have seen before by searching for fresh new photos on such sites as Unsplash and Pixabay. Remember that using no photo or graphic is better than using a bad one. 16. Be passionate about your topic. Whether you are giving a presentation on the different types of sandpaper or the truth factor in urban myths, you should be able to speak passionately about your topic. If you speak about what you love and know well, your passion will encourage the audience to tune into your presentation. 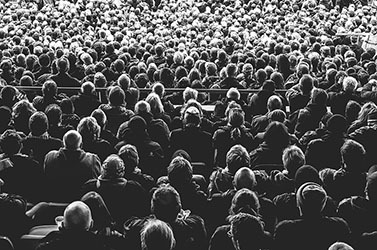 When you know the background of your audience—in other words, what they know and what they need to know—you can structure your presentation to meet these needs. In turn, the audience will be more interested in what you have to say. The easiest way to involve your audience is to ask questions. However, no one wants to ask a question and have no one raise their hand to answer. Try asking general questions, such as “How many people watch videos on YouTube?” Involving the audience helps you connect with them. Stories are easy for the audience to remember; listeners tend to experience the story as it is being told. A good story will also elicit an emotional response in listeners and motivate them to act. Make sure that the story fits the context of your presentation (i.e., has a purpose) and is relevant to the audience. If you know your material, you are less likely to read slides and more likely to look at the audience. You will also feel more confident. 21. Transform your nerves into enthusiasm. Everyone enjoys listening to an enthusiastic speaker. If you speak animatedly, your audience will be inclined to pay attention to you. 22. Take some calming breaths. Take a deep breath before you begin presenting. This may help calm your nerves. 23. Smile and maintain eye contact. Never turn your back on your audience. Another good hint is to stand to the left of the screen. In this way, your audience can look at you and sweep their eyes over the screen. 24. Make sure to show your personality. Steve Jobs was a great presenter because he let his personality shine through. Don’t feel that, just because you’re giving a formal presentation, you must stifle everything that makes you unique. Your personality is what makes you interesting, engaging, and relatable; infuse that into your presentation. 25. Put your game face on. Athletes and performers know that the key to a great performance is to pump themselves up during the pre-game or pre-show warm-up. You need to pump yourself up too. You can run in place, do some stretches, or practice one more time—do what you have to do to get ready. And then, as Nike™ always says: Just do it! It may be counterintuitive, but if you know that you have prepared well and have a great-looking presentation, you should realize that you have done your best. Use that knowledge to relax and enjoy the experience. You can also use humor to joke with the audience and make it fun for everyone. 27. Thank the audience for listening. To conclude your presentation and to cue your audience that your presentation is finished, you can thank them for listening and participating. People appreciate being appreciated. Remember that you can also include a final slide that thanks the audience and provides your contact information. There is no magic formula that you can apply to a presentation to make it great, but if you follow these 27 tips, you should be able to present a memorable, stress-free presentation. Previous post: What Is an Irregular Verb? Find Out and Test Your Knowledge!